Hop Bullet | Sierra Nevada Brewing Co.
Straight pour from a pry-off 12oz bottle to an oversized wineglass (Jester King stemware). This has a bottling date of December 1, 2017 printed in white ink at the top of the back label (“PKGD 12/01/17 15:29”), making this bottle 16 days old at the time of consumption. Purchased yesterday at the brewery in Chico, from a cooler and right into my fridge. Appearance (4.25): This is classic West Coast (D)IPA all the way: just about three fingers of ivory-colored foam rise off of the pour, capping a crystal clear, honey-colored body with orange highlights and rich amber undertones. The head dies down slowly, leaving a cratered, rocky cap with fat, crackling bubbles in the middle and fine, whipped foam around the edges, leaving chunky lacing consisting of big, meringue clumps linked to each other with a fine latticework of leggy lace. Smell (4.25): Not surprisingly, this is dripping with big, bright tones like tangerine flesh, pineapple juice, a hint of melon, a nice splash of passionfruit, and a hint of gooseberry. Key lime flesh and more passionfruit come out as the beer opens up, which is extremely welcome. It’s all underscored by a base of brioche buns iced with light brown sugar frosting. Totally West Coast in style, with one foot in the door of current dry-hopping trends. Taste (4.0): Here, the beer’s character moves away from big, juicy fruit tones and toward an extremely dank, piney, resinous attitude. It’s still underscored with citrus zest, especially clementine or some other thin, not too offensive but extremely fragrant element. It’s got a big, floral bitterness with a nice shot of yellow grapefruit flesh jammed in there, as well, but it’s all coming back to that piney, dank character. It is, however, buoyed by a very nice malt body that anchors the hops without getting in the way—in fact, it complements the hop character nicely, adding a quiet base of something akin to orange-glazed bundt cake. And not a hint of booze to be seen anywhere at all. Like the look and nose, this is West Coast all the way. It’s all very good, but for my taste they’re missing an opportunity to do what they’re doing but with more interesting hops. Mouthfeel (4.5): Miraculously, the body feels full but not heavy, with a thoroughly medium-weight feel. The carbonation, meanwhile, moves in dead-quietly as it spreads across your palate, shifting into a very fine tingle all over before foaming up to a nice, relatively modest but still satisfying volume. No sign of booze whatsoever. The hops help to dry it out a bit, making this way more drinkable than its size would suggest. Overall (4.25): Like most of their beers, Sierra Nevada’s technical perfection is written all over this beer. Whether you like what they’re going for or not, they absolutely bullseye their target, every time. For me, I very much enjoy a big, West Coast-style (D)IPA done well. Sierra Nevada made one that goes above and beyond a lot of competitors by emphasizing flavor where they could’ve gone big in bitterness. Similarly, they used malt well in this beer, offering some character and a nice base in a way that complements, rather than offset or hide from, the hops. They made an outstanding beer in a fairly saturated market, but unfortunately I’m not sure the balance and subtleties will get it noticed. However, it’s drinkability and pricepoint will definitely win some fans. Recommended. really good beer. its great to see these guys doing so much new hoppy stuff lately. i really like the fresh hop cans, and this one is nice too, even though i dont want to see a spring seasonal in december, its just not necessary, but that is my only critique of this beer, and its not even a critique of the beer itself, its excellent stuff, one of their best in ages, and i reckon another step toward the lupulin powder thing really becoming mainstream. its golden orange brassy and shiny in the glass, exquisitely clear, under a full inch of gorgeous white head, creamy and snowy and lasting, bubbles creeping slowly to the surface, this thing looks amazing. the nose is brightly hoppy, with a soft citrus profile, vegetal fresh bitterness, and a ton of fruit suggestions to it, but the flavor is really where its at! its sort of classic sierra nevada for the first half, but then there is this glowing wash of mango and mandarin orange that arise out of nowhere and totally turn me on through the finish, must be the lupulin dust, because i sure dont know magnum to taste like this, not in the least. white wine and pine too, but the mandarin and mango really lead, but most of these flavors come at or even after the swallow, unique for this to me the most prominently hoppy moment in this way, its just awesome. fuller bodied but not real sweet and certainly hiding its strength really well. one of the better sierra nevada releases in a long time, and while i wish they would wait a few months before putting out a spring seasonal (this in fact contributes to the problem of seasonal creep), i genuinely enjoy the beer! well done! Pours clear and a light yellow. Sunshine in a glass. Shines brightly. Fat head of just off white foam that fell somewhat quickly but not too quickly for the abv which is 8 percent. Nose is fruity lemony and a soft sweet floral. No real dankness just touch of twiggy herbs way down deep. The profile on the internet says that this hop does not display any aroma qualities and usually it is used as a bittering hop. I found plenty of fruity character in them but nothing loud. I also find a bit of soft stone fruitiness. It is merely a suggestion and nothing too well defined. i actually think it is part of the floral. The beer drinks well and with a clean and crisp flavor. Fruity but not orangey. It's subtle lemon and light herbs. As I drink I pick up hints of grapefruit peel. That is a very tempting flavor on the beer as it is heady and a bit pungent and earthy. Finish is soft and clean, a bit gentle but there is some firm bitterness. No alcohol on the nose or on the palate. The beer is satisfying with cracker malt and a bright touch of sweetness to contrast those hops. The spice quality is not muted but it is not dank. I might even say it's a little piney. What I like about this hop is it's refreshing clean palate. I think it would be great alongside a peachy or mango type hop. I decided to pair it with some turkey salad I made with home made sun dried tomato crackers. The deep richness of the sun dried tomato and it's light sweetness was a perfect match here. The turkey salad was made with gamier dark meat and instead of mayo I used thyme infused olive oil, fresh thyme and distilled white vinegar. With only salt and fresh cracked black pepper on it , it was a great partner to this beer with it's clean and distinct finish. For my second dish I paired it with phat bai horapha or thai basil beef. The spiciness in the dish loved the sweet cracker in this malt. The clean character of these hops let all the earthier aspects shine in my dishes. From fresh cracked black pepper to sweet red pepper and I could taste every part of my food as well as every part of this beer. It would also pair with desserts like peach pie. You can session this beer if you can stand the abv because it does not overly bitter the palate. Was not too crazy about this double IPA from Sierra Nevada. Had a pretty 2 finger head with poor head retention and a yellow/gold appearance. Smell was fruity with a lot of alcohol and much pine. Taste was way too boozy for me. The alcohol was so overpowering; tasted like I was drinking straight alcohol almost, however it was oddly smooth to drink. Drinkable but definitely would not buy again. This beer is surprisingly incredibly drinkable for 8%. Compared to Torpedo, it is much more drinkable. Don't get me wrong, I like Torpedo, but for this beer being a double IPA, it to me, has very little lingering bitterness. I get a lot of citrus, a little bit of pine, and actually quite a bit of tropical fruits (given the hop varieties they used) on the nose but like others have said, the taste is where this beer truly comes alive. Again DRINKABILITY is what comes to mind here. You get the great hop flavor but also a subtle bitterness that I think works very well for this beer. Great job Sierra Nevada!! Think it may be time to start labelling ipas as west coast and east or NE ipa. This beer is a solid west coast style piney iipa. Nothing mind blowing, but decent, crisp, and hoppy. A good commercial west coast double. 12 ounce bottle into tulip glass, bottled on 12/23/2017. Pours slightly hazy medium golden yellow color with a 1-2 finger dense and rocky white head with awesome retention, that reduces to a nice cap that lasts. Nice dense soapy lacing clings on the glass, with a moderate amount of streaming carbonation retaining the cap. Fantastic appearance. Aromas of big grapefruit, tangerine, peach, pineapple, apricot, mango, lemon zest, orange peel, citrus rind, pepper, pine, wheat, cracker, white bread dough, light honey, herbal, and floral/grassy earthiness. Damn nice aromas with great balance and complexity of citrus/fruity/earthy hops and moderate pale malt notes; with great strength. Taste of big grapefruit, tangerine, peach, pineapple, apricot, mango, lemon zest, orange peel, citrus rind, pepper, pine, wheat, cracker, white bread dough, light honey, herbal, and floral/grassy earthiness. Moderate pine, citrus peel, herbal, grassy, peppery bitterness on the finish. Lingering notes of grapefruit, tangerine, peach, pineapple, apricot, mango, lemon/orange peel, citrus rind, pepper, pine, wheat, cracker, white bread dough, light honey, and herbal/floral/grassy earthiness on the finish for a good bit. Great complexity, robustness, and balance of citrus/fruity/earthy hops and moderate pale malt flavors; with a great malt/bitterness balance, and zero lingering hop astringency after the finish. Fairly crisp/clean finishing. Moderate increasing dryness from bitterness. Medium carbonation and light-medium body; with a very smooth, moderately bready/grainy, and sticky/resinous balanced mouthfeel that is fantastic. Zero warming alcohol for 8%. Overall this is an excellent DIPA. All around great complexity, robustness, and balance of citrus/fruity/earthy hops and moderate pale malt flavors; very smooth, crisp, clean, and easy to drink with the modestly bitter/drying finish. Really old school feeling DIPA, and surprisingly light on body for the ABV. Dank, earthy, and vibrant classic C hops; with just enough pale malt to balance the bitterness. Never overly aggressive. A bit vegetal/green peppery tasting, but I really enjoyed the hop profile. A very enjoyable offering. Nice looking hazy, amber color with a lingering one-finger, foamy-white head. Inviting on the nose with strong hints of pineapple, grapefruit, lime, violet, mineral and honeysuckle. Punch in the front palate of honeysuckle, fauna, tropical fruit and golden apple, with a smooth back-palate finish of warm biscuit, green bell pepper and a hint of pencil shavings. I like the complexity. Not overpowering, good balance. Slightly prickly feel with a long finish. Overall a pretty cool beer. Very under rated beer. I live in Vt and have had many of the best in this category. It doesn’t punch you in the face with hoppy-ness but I don’t always want that. It’s great with food. The punch you in the face beer like Heady Topper is good but it’s like a meal itself. Takes away from the food instead of going well with it. It’s my go to beer when I find it. A honey gold color with a lot of lager-like transparency. Head is fleeting but sticks around at 1/2 finger and leaves some nice hilly lace on the sides. Aroma of juicy citrus fruits, pine forest, honey, mango, and light caramel. Flavor begins clean with a quick yet long-lasting stab of pine needles to the tongue, followed by peppermint, orange rind, grapefruit rind, and lemon. Orange blossom and hop oils linger on the palate. Very clean feeling up until the finish where it's all resin. Feel is deceptively clean and crisp but the finish is pure oil. It just coats the tongue and won't let go. Overall, this is for sure a palate wrecker. I tried it out of pure curiosity since I have a ton of really nice IPA's to drink and SN is kinda towards the bottom of the list for me. It for sure delivers for those who want nothing but IPA on their palate for the next three hours. As for me I'll stick with my juice bombs. 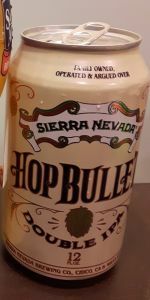 Sierra Nevada "Hop Bullet Double IPA"
12 fl. oz. brown glass bottle, "PKGD 12/13/17 0850"
Notes via stream of consciousness: "...Magnum hops and lupulin dust..." Interesting. I'm not sure what they mean by lupulin "dust" but I'm curious. Also, this is a spring seasonal. Hmmm. OK, so it's poured a slightly hazy golden body beneath a good sized head of pillowy off-white foam that's slowly dropped to become creamy. Sheets of broken lace cover the entire area where the head originally was. On to the aroma... I'm not finding it very bold. In fact, without having one in front of me, I might guess that their standard pale ale has more aroma, or at the very least the same amount. It's floral, slightly piney, just mildly citrusy, and a touch herbal. There's some nice, lightly sweet malt to it as well. The flavor is probably much fuller though with a solid 8.0% ABV so let's see... hmmmm, yes and no. Yes, it's certainly fuller than the aroma suggests, and there's a nice note of orange in there as well, but no because it's not really that much fuller. In fact, this is one of the softest double IPAs I've ever had, which is actually a good thing. It doesn't have that hop bite you sometimes get - it's remarkably smooth. I could drink a lot of this, to my own detriment - dangerous beer! It doesn't even seem that bitter although I see that it's got 60 IBUs to it, but that makes sense as a lot of standard IPAs are 60 to 70 and this has more of a malt component to it. Wow, pretty nice. Sometimes DIPAs are also sweet at the same time, balanced by a fuller bitterness but kind of like a see-saw and that's not the case here, the sweetish malt is balanced right off of the bat. It's medium bodied with a light dextrinous edge, and gently crisp with a moderate carbonation. Again, really easy to drink. The alcohol does appear though, showing it's strength in the finish, so you know you're not just drinking a malty pale ale. I'm impressed, it's very refined, a bit of a "velvet hammer" if you will. For fans of double IPA where the malt is just as important as the hops, and a big slap of hops isn't necessary to open your eyes, this one's a winner. Clear golden ale with a tall puffy off-white colored head. Smells strongly of sandal wood and cedar. Tropical fruit and wood scent is very strong. Passion fruit and pineapple are strong. Scent of orange lemon and grapefruit. Strangely there is a smoky scent here and a little bong water scent. Starts out savory and a little sour. Sensation of salt on the tongue. Taste of pine board and citrus. Overall for the Hopheads. Would have liked more tropical tastes and less woody. Today is the occasion of my Happy New Sour/Sierra/Sara Nevada Nac Sunday (Week 673) & having accomplished the Sour & Saranac portions of today's madness, I am now turning my full attention towards Sierra Nevada. From the bottle: "Hop Bullet Double IPA features a new technique: we're hitting the beer with a double-barreled slug of Magnum hops and lupulin dust—the source of hop flavor and aroma—right into the fermenter for a ballistic burst of aggressive hop character. "; "We brew in Chico, CA and Mills River, NC, to bring you the finest quality beer." I Pop!ped the cap & began a nice, slow, gentle pour towards the door as the bulls busted in, bullets flying! I grabbed the nearest spoon & gave the place a quick swirl in the hopes of eradicating any evidence. I was taken by surprise when things suddenly blew up, creating two-plus fingers of dense, foamy, rocky, eggshell-white head with moderate retention. The lining of the joint was suddenly coated in sticky lacing, so I pushed one ah the piggies backwards into it as I leaned into the flivver that I had idling at the curb. It smelled like somebody forgot to take all of the bags of muggles into the hideout last night! No wonder I had the fuzz on top of me. get downwind of this action & take a deep sniff. It was like we fired dust outta a shotgun! Speaking of which, I racked a couple of shells into mine & let fly to give myself some breathing room. It was sunrise & the color was a gorgeous Yellow-Gold (SRM = 4 -5) with NE-quality clarity, but I had not time to wait for The Gelt Gang of Midas, Mammon & Croesus to show up. Things were happening too quickly for my liking & I needed to get this road show on the road where it belonged. I turned & raised my glass in a toast to th' moll, laying dead onna porch wit' a bullet in her pump. Dang! Mouthfeel was medium-to-full, not quite creamy, but evocative of her lips on mine the last time ... Ah, hell. The blues are right up my tailpipe and while I expect to taste pork & bacon, I was getting lovely notes of citrus and tropical fruits, beautifully commingled for a hops experience like no other in my memory. I was just complainin' to Louie the other day that I didn't like the way we wuz lumpin' the tropical hops in wit' th' other AIPAs since they tend to be less bitter & more fruity. This Bullet of Hops made for a DIPA that bridged that gap. Of course, now I was being tailed by that hotshot, LT Bullitt in his snazzy souped-up auto. No matter, I got a hitter wit' me if we can just get off a clean shot. Ah, s**t, I'm runnin' ahtta road & beer! This is the finish! Cool, powder dry, lightly tropical fruity with a good bit of citrusiness. If I'm checking out, this is the way to go! Poured into a Trillium glass a pretty nice clean/clean dark golden orangy color, pretty nice carbonation, with a pretty nice thick/creamy one-finger white head, which also leaves some pretty nice sticky lacing behind. The nose is hoppy, malty, with a nice citrus complex (orange, tangerine, grapefruit), nice pine note. The taste is pretty nice, hoppy, malty, with a pretty nice citrus complex (orange, tangerine, grapefruit), pretty nice pineyness. Medium body, ABV is hidden pretty nicely, with a nice dry/bitter finish. Overall, a pretty tasty brew. 12 oz. Bottle 6 pack. $9.99 for a double IPA. Pours as a lively and clear, solid golden color. Light snow white fluffy top. The foam cover is clumpy but dissipates pretty quick to some minimal coverage and a solid ring. Minimal lacing. The aroma has some nice fruity hop notes, sweet citrus edge, orange with tropical pineapple, red juice, peppery golden wheat, a heady, wild honey sweetness to the malt and slight dry herbs and spices. The sweet edge to the hops is very nice. Slight cinnemon and caramel at the end. A very crispy, light golden malt bite hits home first, excellent golden grains and subtle sweetness makes the malty backbone really pop. The mega mix of hops brings in earthy tones first, dry leaves and wheat, and a low level bitterness. The fruity edge is sweet and slightly citric with big tones of pine...lupilin dust brings another level of hop flavor but the magnum certainly steals the show. The hops are impressive but the balance of flavor's and malty side is the most impressive part. No way you would ever guess this was 8% abv. The complexity and density is a bit low for a DIPA, but the crushability is very high. The bittering and earthy tones is spot on 60 ibu. Pretty mellow for a Dipa. Highly enjoyable if you're looking for a more mellow approach to a bigger ipa. Bizarre. Very bizarre. Don't look like a DIPA. Don't drink like a DIPA. Clean look, much mare akin to a light lager...smooth to drink. Hard to believe this an 8% DIPA. Gets an A+ for being unique...not bad on the pallette either. Poured from a 12 oz bottle into a tulip glass. Bottle is 22 days old at time of review. Pours a clear golden amber color with a finger of white head. The head leaves a ring of lacing before settling into a thin sheet. Beautiful color. The aroma is straight up danksauce. Grassy, piney, and herbaceous. There's some notes of grapefruit and caramel malt on the back end. The flavor is shockingly sweet and malty. Lots of caramel and sweet biscuits. There's some grapefruit, orange and a touch of lemon with the earthy, dankness barely coming through on the finish. The feel is medium bodied with moderate carbonation. Crisp and dry and exceptionally clean. Drinks more like a hoppy lager. Overall, I'm not quite sure what to make of this beer. It's not at all bad, but it does not drink like a DIPA. The aroma led me down a psychedelic path only to find a sweet, malty sobriety test at the end. It's crisp, clean, and refreshing. Like a hoppy lager. I'm either insane or Sierra Nevada mislabeled this one. Either way, it's a solid beer. Just not one I'd try again. Ok, this beer is good. Floral, grapefruit hoppy beer. Not the bitter grapefruit, but more like ruby red. $15 for a 12pk, so the price is right. Definitely grabbing a few more 12pks soon. Hope to see this every year. i drank this after a colt 45 and i have to say wow! so awesome! this is really good stuff. i love the grapefruit and lemon peel i taste. yummy! Sierra Nevada has never disappointed me! get ya sum! Hop Bullet from Sierra Nevada Brewing Co.